Kris Abbott joined the Ballpark Broadcasting crew in 2016 for the Hill United Chiefs “Rock Invitational”, the 2016 ISC World Tournament in Quad Cities IL/IA, and the Canadian Senior Men’s Championship in St. John’s. He also helped broadcast the 2017 WBSC Men’s World Championships at Whitehorse, Yukon, Canada. Kris works full time as a professional play-by-play broadcaster for Eastlink TV in Halifax, Nova Scotia as the channel’s lead voice covering Major Junior & University Hockey, but his passion is fastpitch softball. Growing up in Portugal Cove, Newfoundland & Labrador, Kris comes from the Abbott family that produced Colin Abbott, one of the greatest hitters in the history of the game. Kris’ father Keith was a three time batting champion in the St. John’s Senior Men’s league and is a Softball Newfoundland Hall of Famer. Uncle Vern Abbott is also a SNL Hall of Famer. Kris played from the age of 4 until his retirement at age 34. He has also been involved as a coach and an administrator at various levels. The highlight of his playing career was as a member of the 3 Cheers Pub and West Side Charlie’s teams from St. John’s. 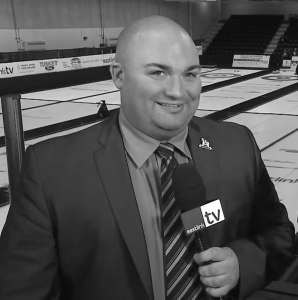 Ballpark Broadcasting first discovered Kris when he was broadcasting the 2014 Canadian Senior Men’s Championship from Charlottetown, PEI. Much like on the field, the broadcast team needs to be a cohesive unit and Kris has meshed with the veterans while providing his own unique spin on the broadcast.